The Kepler-47 system, whose discovery was announced Tuesday (Aug. 28), dwells about 5,000 light-years away, in the constellation Cygnus (The Swan). It is a close binary system, with two stars orbiting near each other at its center. Around these stars whirl two planets known as Kepler-47b and Kepler-47c. They make Kepler-47 the first system seen with multiple worlds circling a pair of stars. 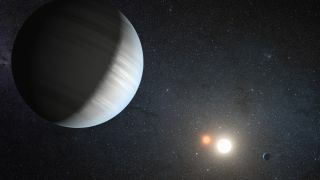 "If single stars and close binary stars can host planetary systems with an equal probability — that is not at all clear at the moment — then it would follow that life could be just as common on circumbinary planets as on planets with single stars," Orosz said. Kepler-47c itself is likely not a good bet to support life. But any large moons of the planet — if they exist — would be very intriguing to astrobiologists, said study co-author William Welsh at San Diego State University. Scientists have already found several exoplanets that are Earth-size or smaller, and they hope to discover many more. NASA's prolific Kepler space telescope, which discovered Kepler-47b and c, is a key tool in this search. Indeed, Kepler's main mission is to determine just how commonly Earth-size planets occur in their stars' habitable zones throughout the galaxy. The telescope detects alien planets by flagging the telltale brightness dips caused when they cross in front of, or transit, their stars' faces from the instrument's perspective..
"I expect that the transits of an Earth-sized planet will be very hard to spot by eye, so we will need to refine our automated search programs to work for binary systems," Orosz said. "As Kepler gets more and more data, the chances go up that we can identify the smaller transits due to terrestrial planets." The scientists published their findings online Aug. 28 in the journal Science. They also detailed their results Aug. 29 at the General Assembly of the International Astronomical Union in Beijing.